The planned community of Aliso Viejo's original 6,600 acres were once part of the 26,000-acre Moulton Ranch, owned by the Moulton family, who took title in the 1890s to land originally granted to Juan Avila by the Mexican government in 1842. Over the years, portions of the ranch were sold and became Leisure World, Laguna Hills and Laguna Niguel. In 1976, the Mission Viejo Company purchased the remaining 6,600 acres to create a new planned community – Aliso Viejo – with a master plan for 20,000 homes for a planned population of 50,000. The master plan was approved by the Orange County in 1979, and homes were first offered for sale in March 1982. Aliso Viejo's first family moved in that November. As part of the project, 2,600 acres were dedicated to Orange County as part of the Aliso and Wood Canyons Wilderness Park, and 800 additional acres were set aside for local parks, recreation, schools and community facilities. The Aliso Viejo Community Association (AVCA) was set up to manage the local parks and community open space. It was the first community-wide association of its kind in California and has the unique ability to provide a full-range of community services and facilities. Aliso Viejo was the first planned community in California to plan a balance between the projected resident work force and the number of projected jobs within its borders. Pacific Park, the centrally located 900-acre business park and town center, was expected to ultimately provide more than 22,000 jobs. Every home in Aliso Viejo was located about 1 1/2 miles from Pacific Park, to encourage live-and-work opportunities. 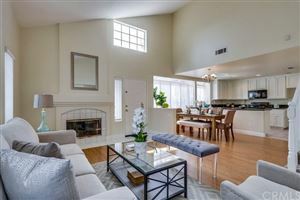 Based on information from California Regional Multiple Listing Service, Inc. as of Apr 22, 2019 11:54:am. This information is for your personal, non-commercial use and may not be used for any purpose other than to identify prospective properties you may be interested in purchasing. Display of MLS data is usually deemed reliable but is NOT guaranteed accurate by the MLS. Buyers are responsible for verifying the accuracy of all information and should investigate the data themselves or retain appropriate professionals. Information from sources other than the Listing Agent may have been included in the MLS data. Unless otherwise specified in writing, Broker/Agent has not and will not verify any information obtained from other sources. The Broker/Agent providing the information contained herein may or may not have been the Listing and/or Selling Agent.